Everyone loves the beach but sometimes the people nearby display some bad habits that can add a bit of ire to an otherwise relaxing afternoon. Let’s take a look at some of the most complained-about rude beach behaviors. The first on our list is just all around bad for everyone. It’s those folks who leave their trash behind. “It’s just one cup, someone will clean up after me.” Yes, someone WILL have to clean up after you, won’t they? Cups, diapers, parts of Styrofoam coolers, the wrapper for a sandwich or candy bar; they all get left behind by the inattentive, the apathetic, the inconsiderate, and the spiteful. How those folks were raised is a question we will leave, for now, to philosophy or the various sciences of the mind. The result is one of the most disappointing beach experiences anyone can have. You arrive for some much-anticipated beach time only to find litter along your path or dancing about in the waves at the waterline. We try to help out whenever we can by tossing one or two items into the trash on our way in our out, and we always pick up plastic grocery bags, since those can kill our endangered sea turtles here at Clearwater Beach. 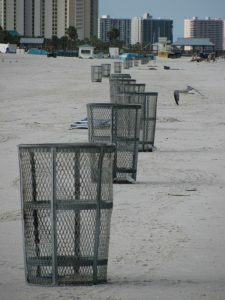 Our beach has a cleanup crew, fortunately, so most of the time, the beach is clean of debris. That doesn’t get the offenders off the hook, however. To them we extend an invitation to stay home. A subset of the litter bugs is the cigarette tossers and the cigarette buriers. 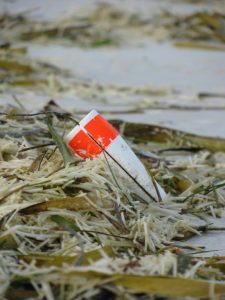 Yes, cigarettes are trash and they do mess up the beach. That sand isn’t an ashtray and those rotting little butts remain behind for months if not years. Despite the small size, those discarded cigarette ends transform a beach from a pleasant appearance to a trashy one in the flick of a finger. Those flingers need to figure out a way not to trash the beach we all enjoy. Please try a little harder. The next item often labeled as irritating is loud music. Don’t get us wrong, enjoying a good tune at the beach can be a wonderful experience. That works best on beaches that do not have lots of other beach-goers in close proximity, however. When you are surrounded by sunbathers and families enjoying the beach on their own terms, that music can detract from their experience. Musical taste is extremely subjective, so no matter how good that music seems, not everyone is going to like it. 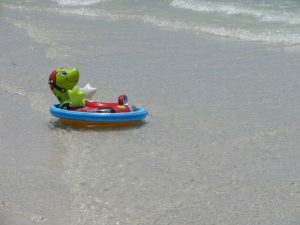 Further, many people expect a beach experience free of radio noise altogether, which is not an unreasonable assumption. It boils down to understanding that you are not the only one out there. A common complaint on beaches is the boundaries of personal space. Where does your territory begin and the next guy’s end? Fortunately, here at Clearwater Beach, we have large swaths of sand that make claim-staking rather easy. Still, your concept of personal space and the next person’s are not going to match. If you’ve grabbed “the best spot,” it’s no fun to move. On a crowded beach, like you’ll find on holidays such as the Fourth of July, you have to apply an extra dose of patience. Unfortunately, accepting that you are going to have people right next to you is often the best remedy. Another subset of the beach-real-estate-grabber-pet-peeve is the group who sets up a small condo complex of shade tents on the sand. To be honest, we actually don’t mind the tent complex folks. Here on Clearwater Beach, and, really, all the beaches to the south of here, down to St Pete Beach, there’s a lot of sand. It’s literally impossible to take so much space that others don’t have any. And, it kind of looks like a good time. We understand if not everyone enjoys the beach multiplex style of beach-going. So long as they are not blocking your view or playing their music loudly, tolerance is surely the best solution. A possible offshoot of those who intrude on personal space are those who get their sand everywhere. No one wants to look like a sugar dipped donut when the sand sticks to the coconut oil. There’s the sand kickers, the towel shakers, and the sand tossers, all violating your preciously sand-free towel. It’s a little harder to relegate this one to opinion and personal preference. Either that person got sand on you or they didn’t. It’s always disappointing to find that strip of sand next to your beach blanket has become a natural highway people use to get down to the shore. Of course, if you’ve brought your own children to the beach with you, you probably forewent the concept of a sand-free towel some time ago. That brings us to another often-complained about issue for the beach – the uncontrolled child. Are the parents watching their little ones fling sand on beach goers? Do the parents realize that the flock of seagulls their son or daughter is feeding are going to poop on everyone? While the antics of children and the sound of their joyous screams are a pleasure, some behaviors cross the line. Kids don’t respect personal space and they haven’t yet learned all the manners they’ll need as adults. While a large dose of patience is always best when dealing with children, those parents should be paying attention. When the little wild ones need a tug on the reigns, the parents should be attentive enough to do so. Having a drink with friends can be a lot of fun. The beach can be a lot of fun. Put them together and you have a group of drunk people in the middle of a public beach. 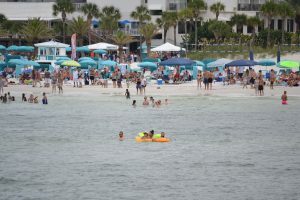 On Clearwater beach, glass bottles and alcohol are prohibited. The only way you will get either of those is if someone is breaking the rules. If you suspect the people nearby are breaking the no-drinking rule but you’re not sure, then you probably have some respectful people nearby, drinking or not. It’s when the partiers get loud and wild that things get uncomfortable for fellow beach-goers. Those partiers should be aware that the only mind going on the journey is their own. Drunken behavior can be disturbing to parents with young children. The beach has plenty of bars, many with views of the beach. Those bars are almost the same as being on the beach, except for the lack of sunburn that you didn’t feel coming. The other not-family-friendly activity is the couple who gets too frisky with one another at the beach. We won’t delve into descriptions of this one too deeply. It is enough to say that they make those around them uncomfortable. And to you, yes you, way out there by the sand bar. It may only be your heads poking out of the water, but we can totally see you. Another bad beach habit is the lack of respect for beach zones. Some areas are for swimmers, others for fishing, and yet others for boating. Most beaches don’ t allow you to land a boat in a swimming area. That doesn’t stop those ignorant of the rules or those who just don’t care. Those problems rarely happen at Clearwater Beach. We have some great fishing areas that draw fishermen to them. Further, our beaches are so shallow that casting a line out or landing a boat is just plain awkward. The last on our list is purely subjective and deals with the possible hiring of a paid force of fashion police. While we don’t want to discriminate against body types, a little more prudence in swim wear choice might not be a bad idea. Let’s just say there’s more than one way to drop jaws with a new bathing suit. With exception of the litter bugs, all those on the list here are a matter of personal opinion and tolerance. Understand that you are going to a very public space. That means bringing your best attitude to the beach will go a long way.